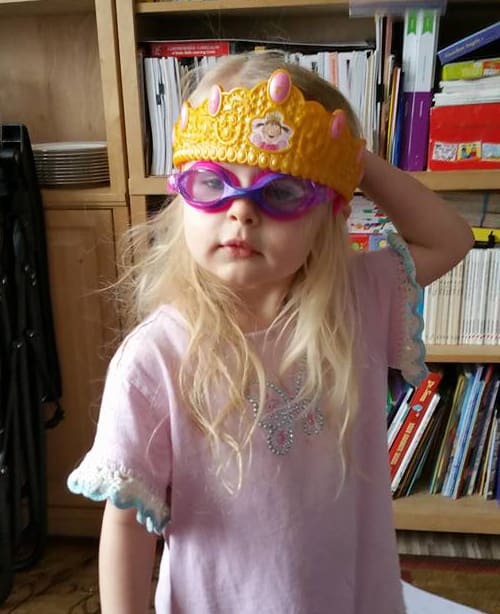 The thing is… we all need a crown now and then. Because, you know what? You and me? We are special, wonderful, marvelous human beings. And sometimes we need to put on that crown. In our pajamas. While we vacuum. It’s a reminder that life is full of new beginnings, changes and choices. Dream. Dream big. 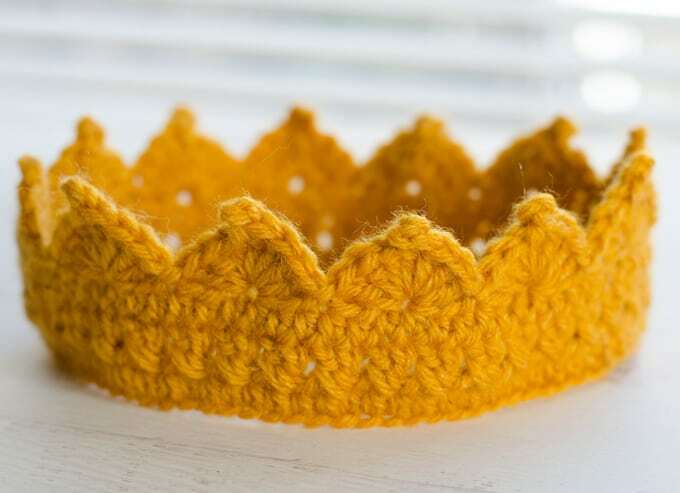 Put on your crochet crown, crank up the music and let it all out. Dance until you laugh and are so tired you have to catch your breath. And remember that your worth is beyond measure. You are queen of your own life. 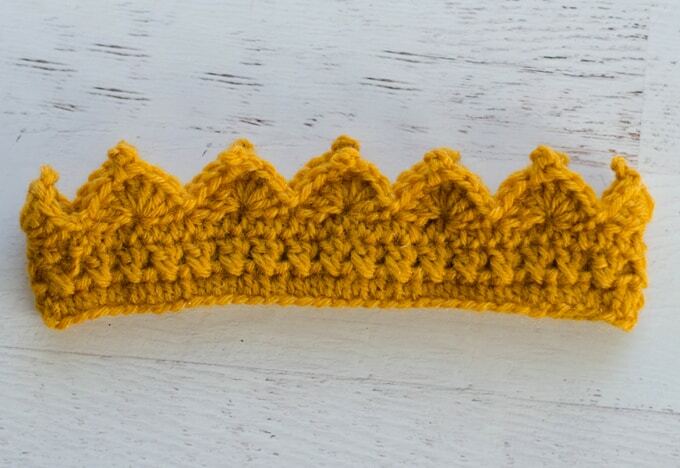 So let’s talk about this crochet crown pattern for a moment. Even though I KNOW you are totally going to make one of these for yourself.. maybe you want to make one for a little one too. So I’ve got you covered. 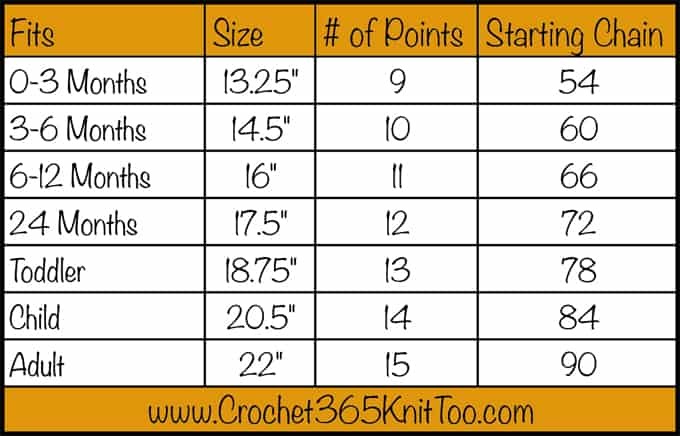 Just find the size you want to make in this chart and chain the corresponding number of stitches to start. Lion Brand Wool-Ease in Gold, 3/8 oz (25-30 yards). Referring to the chart, chain the number of chains indicated for the particular size you want to make. Join with a slip stitch to the first chain, being careful not to twist the chain. If possible, try the chain ring on the person who will be wearing the crown. It will stretch a bit when done. But now is a good time to change sizes if you need to. R1: ch 2 (counts as 1st hdc) Hdc in each chain. Join with slip stitch to the top of the starting chain. R2: This row is a X stitch double crochet round. To start, Chain 3 (counts as 1st dc), dc in the previous hdc (in this case, the last stitch of the previous round, this double crochet should cross over the starting chain 3 (see photo). Going forward again, skip the starting ch and *skip the next st, dc in the next st, dc in the previously skipped stitch, crossing over the stitch just worked*. Repeat * to * around the crown. Join with a sl st to the top of the starting ch 3. R3: ch 2 (counts as 1st hdc) Hdc in each st. Join with slip stitch to the top of the starting chain. R4: sl st in next st, *skip 2 st, in next stitch, work [4dc, ch 3, sl st in previous dc (forms the picot), 3 dc], skip 2 st, sl st in next st*, repeat * to * around. Join with sl st to starting st. Fasten off and weave in ends. I love seeing your finished projects! If you share your Brawny Beanie Crochet Hat on Instagram, be sure to tag me @crochet365knittoo. If you are on Facebook, stop over to the Crochet 365 Knit Too Facebook page and share a photo! I’d love to see your work! Written pattern copyright Cheryl Bennett 2018, all rights reserved. Please do not reprint or repost this pattern. 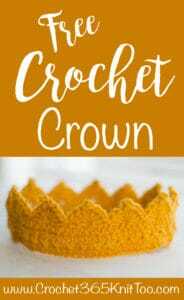 If you would like to share this Crochet Crown pattern with others, just link to this page. If you’d like to make items for sale from this pattern, please visit my About page for more information.